As announced in their settlement press release, TiVo, Dish Network, and EchoStar have settled their patent disputes, with $500 million going the way of TiVo (initial payment of $300 million and $200 million in 6 installments between 2012 and 2017). Also, as part of the agreement, patent licenses were granted multi-laterally. A previous payment of just over $100 million to TiVo for the time warp patent brings the total paid (or to be paid) to TiVo to over $600 million. “We have tremendous respect for TiVo’s management, and we have always said that regardless of the outcome of the case, there were many ways that we could work together with TiVo,” said Charlie Ergren, Chairman and CEO of DISH Network. “We are extremely pleased to reach an agreement with DISH Network and EchoStar which recognizes the value of our intellectual property,” said Tom Rogers, president and CEO of TiVo. 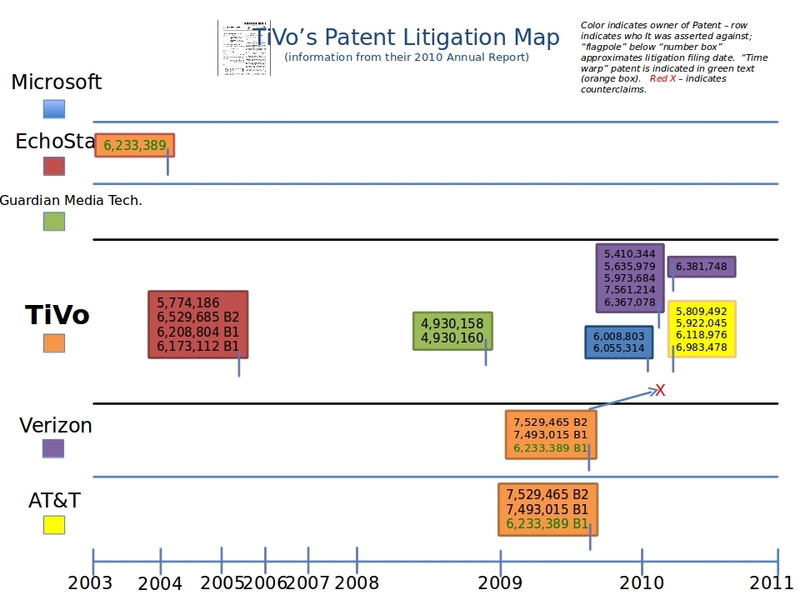 As a prelude to things to come he added “those efforts (to diligently enforce TiVo’s intellectual property rights) will aggressively continue with other parties.” It seems the statement in the 2010 TiVo annual report that “the emerging enhanced-television industry is highly litigious” is no exaggeration. TiVo has complaints against Verizon and AT&T, which are pending resolution. One of the central patents in question to all of this is patent 6,233,389 “Multimedia time warping system,” the TiVo innovation that allows you to record one program while simultaneously watching another on a different channel. This patent now accounts for over $600 million in revenues (past and future) for a company that recorded $237.6 million in revenues for 2010 and a market cap of just about twice the litigation figure (approximately $1.2 billion). Clearly this patent and associated productization and litigation has paid huge dividends for TiVo – time travel DOES pay. In looking further into the future of TiVo, it is noteworthy that their primary business model is driven by OTHER manufacturers and cable operators (i.e., they rely on others for distribution). Their brand is strong and they obviously have some very valuable IP, but they may be vulnerable to the vagaries of the shifting media markets and their convergence (video and media delivery overall has massively changed in the last 5 years). For these reasons, they would seem an ideal candidate to be acquired to a more substantial player in media (Google and Apple included). If TiVo’s brand or technologies and IP can be leveraged successfully by one of these players (Google, Apple, or someone else), it certainly doesn’t seem far-fetched to suggest that their market-cap of $1.2 billion (or some multiple) would be a very justifiable acquisition, particularly on the back of the $500 million “time warp” judgment.